An amazing Key West eatery, laid-back Blue Heaven features delicious cuisine (the lobster eggs benedict comes highly recommended!) along with its rich history. Formerly a dance hall, gambling den and bordello, the establishment also hosted cockfights and boxing matches refereed by none other than Papa himself. Be on the lookout for roaming chickens at the outdoor dining area! Be sure to get there early for breakfast or endure a lengthy wait! When Hemingway and his second wife, Pauline, first arrived in Key West in 1928 they stayed briefly at this location, which was then known as the Trev-Mor Hotel. The couple was waiting for the arrival of a new Ford Roadster from the car dealer located downstairs. 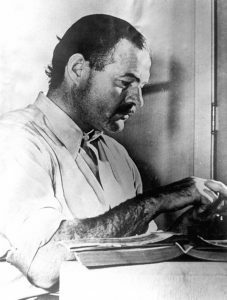 Hemingway allegedly finished his 1929 novel A Farewell to Arms during this period. In addition, the couple fell in love with the island and decided to make Key West their permanent home. Note: The building is not open to the public. Captain Tony’s Saloon is billed as “the first and original Sloppy Joe’s Bar” and reportedly served as the inspiration for “Freddy’s” in Hemingway’s 1937 novel, To Have and Have Not. The bar was previously known as The Blind Pig, while the building itself was erected in 1851 and formerly served as an icehouse and morgue. Hemingway’s friend, “Sloppy Joe” Russell (1889-1941) owned the place and reportedly decided to move the bar to its present location on Duval Street in 1937 when his rent was raised from $3 to $4. According to legend, bar patrons simply carried their drinks with them as they casually strolled from the old location to the new bar. Key West legend Captain Tony Tarracino (1916-2008) later bought the bar. Captain Tony served as the inspiration for Jimmy Buffett’s song, “Last Mango in Paris” off his 1985 album of the same name. Highly talented singer-songwriter Tony Brehm recorded the amazing Live at Captain Tony’s Saloon here. A fascinating museum operated by the Key West Art & Historical Society, the Custom House showcases more than 200 years of Key West history and features an impressive permanent exhibit about Hemingway. Dry Tortugas National Park lies nearly 70 miles west of Key West and is accessible only by seaplane (Key West Seaplane Adventures) or boat (Yankee Freedom). It is home to the Civil War-era Fort Jefferson, the largest masonry structure in the Western Hemisphere. Notable prisoners held at Fort Jefferson during the Civil War include Samuel Mudd, Edmund Spangler, Samuel Arnold and Michael O’Laughlen, who all had been convicted of conspiracy in the assassination of President Abraham Lincoln. Hemingway enjoyed many fishing expeditions to the Dry Tortugas during both his years in Key West and later in Cuba. During one memorable and harrowing adventure, Hemingway and his “Key West Mob” reportedly spend two weeks stranded at Fort Jefferson during a severe tropical storm. Ideally located just a block from Duval Street, the Ernest Hemingway Home & Museum has been designated a National Historic Landmark. Some of the tour guides tend to embellish a few of the stories surrounding the Ernest Hemingway house, but that’s all part of the fun! Just enjoy the tour and take any of the “facts” you hear about the house with a grain of salt. Built in 1851 by captain, ship’s architect and salvager of shipwrecks Asa Tift (1812-89), the house was bought by Ernest and Pauline in 1931 at the cost of $8,000 (Pauline’s uncle Gus chipped in the money as a wedding gift). They lived here with their two sons, Patrick and Gregory. Hemingway created a makeshift writing studio on the second floor of a carriage house and connected it to the master bedroom via a walkway. In 1938, an in-ground, saltwater pool was added to the grounds at a cost of $20,000. Be sure to pet one of the dozens of polydactyl (six-toed) cats that reside on the grounds. Bronze busts of Hemingway and other famous former Key West residents – including Harry S. Truman, Henry Flagler, Asa Tift and Papa’s buddy Captain Edward “Bra” Saunders – can be found at the Key West Historic Memorial Sculpture Garden in Mallory Square near El Meson de Pepe restaurant. The busts are the work of highly talented sculptor James Mastin. “If you don’t like to read, you haven’t found the right book.” Billed as “Key West’s Favorite Book Store since 1976,” Key West Island Books features an extensive selection of books by and about Hemingway, as well as first editions and signed titles. They also boast a superb collection of books about the Florida Keys and the Sunshine State in general. Prepare to spend an hour or two browsing in this wonderful bookstore. Designated a National Historic Landmark, the Key West Lighthouse lies directly across the street from the Hemingway house on Whitehead Street. According to legend, Hemingway would use the lighthouse as a marker as he made his way home during nights of drinking at Sloppy Joe’s Bar. Built in 1848, the Key West Lighthouse rises 73 feet and features 88 steps to the top. Take a guided tour of this local rum distillery and enjoy a complimentary tasting. Papa’s Pilar Rum Distillery was named after Hemingway’s legendary 38-foot fishing boat, Pilar (currently on display at the Museo Ernest Hemingway at Hemingway’s former home, Finca Vigia, which lies just outside Havana, Cuba). A longtime controversy exists between Sloppy Joe’s Bar and Captain Tony’s Saloon over which bar Hemingway patronized. For the record, I personally believe he hung out at both bars! Sloppy Joe’s Bar hosts the immensely popular Hemingway Look-Alike Contest (just look for the horde of overweight, bearded guys drunkenly wandering all over Duval Street!) as part of the annual Hemingway Days celebration in July.